Another friend of mine got married! I am really happy and giddy every time I receive a wedding invitation. It makes me feel special that among all the people they know, they still include my name in their guest list. In return, I make it a point to be present on the wedding ceremony itself as well as the reception. 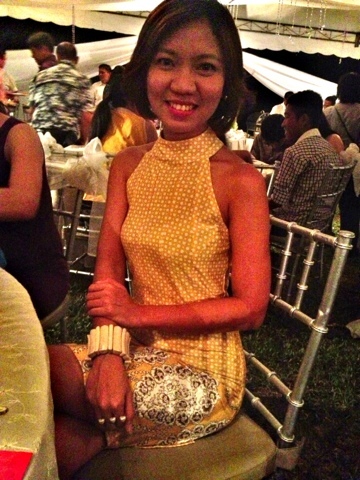 While thinking of what to wear for the wedding, I remember that I have this printed yellow dress that I bought from Karimadon way back 2009. I only used it once during our family reunion Christmas of that same year, so I decided to just wear this again for this occasion. The pumps I was wearing were from Payless. 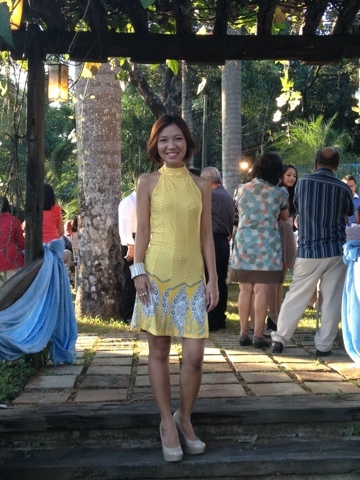 I love wearing this shoes as you will notice in my future outfit posts, but that day, I realized that it would have been more comfortable for me if I wore a different pair during the ceremony. 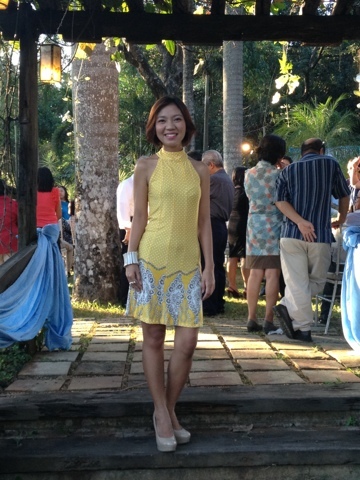 As what Beverly told us over dinner, flats or wedge type are the recommended shoes for garden wedding. Fortunately, I survived that night! Thanks to the concrete paths here and there in the garden. So to Aldrich and Anna, congratulations! Hope you will have happy years and many special moments together as husband and wife. God Bless!